Today we’ve rounded up our 10 Best Furniture Painting Techniques just for you! There’s nothing more rewarding than transforming an old tired looking piece of furniture into something lovely that works perfectly in your home. Dressing up that old Dresser, Table or Chair with a few coats of paint, can give you instant satisfaction and years more enjoyment out of something that might otherwise have ended up sitting in your garage for a very long time, or worse yet… may have gone into the dumpster. It can be even more fun when you find that piece on the side of the road or in a dumpster already, cast off by it’s previous owner, and then you get to bring it back to life! And yes, I have been known to do this. We’ve searched through our Tutorial Archives here at The Graphics Fairy to find your favorite Furniture Painting Tips and Techniques. Plus, we threw in a few Painted Furniture projects for inspiration! This is a great collection of some of our best Techniques for DIY Furniture Painting. These fun, and fabulous techniques and faux finishes, are perfect to use in your next Furniture Painting Project! In this post, you’ll find 10 links to Furniture Painting Mastery! Whether you’re going for a Farmhouse style look, Cottage Style, Shabby and Chic, Traditional or Victorian, we’ve got you covered with these finishes. You can learn all of the FREE Techniques by clicking on the links below, to get the full step by step instructions! 1) CREATE AN AGED COPPER FINISH! Learn how to use Chalk Type Paint and Wax, Gel Stain, and Venetian Texture to enhance your DIY Furniture Painting Projects. This effect imitates that beautiful turquoise patina of old copper. 2) SHIMMERY ANTIQUED PAINT EFFECTS! 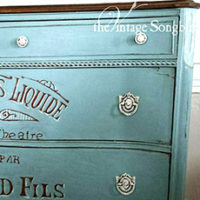 Discover how to rehabilitate some gaudy old cast-offs with a luminous effect using Chalk Type Paints and Gilding Patina. Such a stunning look that will add instant elegance to your piece! 3) FRENCH GREY AGED PATINA FINISH! See how easy it is to add an amazing French Farmhouse flavor to any piece of furniture with this layered finish project. This technique would be lovely in any Country Style Home. 4) FAUX VERDIGRIS FINISH PAINT TECHNIQUE! This Finish creates luscious results and it’s super-simple to do! Join the fun, using this tutorial, and you’ll have a wonderful finished piece to show for your efforts. Great to use on Garden Style pieces. 5) HOW TO USE METALLIC GEL STAINS ON FURNITURE! 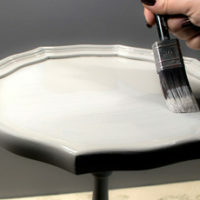 Learn how Metallic Gel Stains add the glamour and gleam of precious metal to furniture projects! It’s a simple and satisfying process, that works equally well in a Vintage or Contemporary Style House. 6) RAISED STENCIL TEXTURE TECHNIQUE! This technique will bring another dimension to your furniture, literally. Learn to add the look and feel of carved wood with Venetian Texture Medium, Chalk Type Paints, and Gilding Patina. Such a dreamy looking technique! 7) HOW TO USE FURNITURE AGING POWDERS – RUST DUST EFFECTS! Impart a touch of rusty ‘farmhouse’ to almost anything and enhance your next furniture project with Aging Powders! 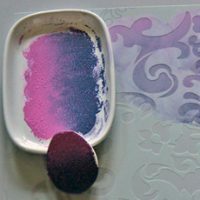 You will have so much fun experimenting with Aging Powders and Rust Dust. The are a bit like magic and totally addictive. 8) “ANTIQUE” SILVER FURNITURE FINISH! Add vintage sophistication to your furniture with this easy 3-Step process–chalk type paint, staining gel, and spray wax. Visit this simple but fun and useful little tutorial. 9) JEWEL TONES PAINTED FURNITURE FINISH! This is a super quick technique to add a color to your next furniture project. You can easily replicate this bright aqua finish. 10) DIY WEATHERED FURNITURE FINISH! Join Heather as she explores a variation on this popular decor trend. As she takes a battered French Provincial Coffee Table to a wonderfully weathered statement piece! 1) DIY COASTAL STYLE DRESSER! Check out this fabulous DIY project adding some Coastal Style Flair to a simple dresser. 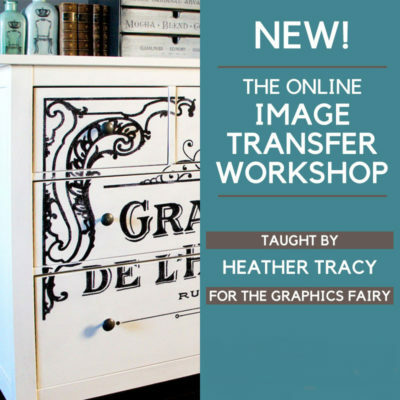 See the easy paint technique for adding The Graphics Fairy Vintage Seahorses to the drawers. A great project for a Beach house or for anyone that just wants a Beachy look. 2) Milk Paint Dresser! See how to turn a Craig’s List find into a drop-dead gorgeous heirloom piece with Milk Paint and our Clothing Ad with Oval Frame image. Also, be sure and check out the How to Transfer Typography onto Furniture post HERE. 3) DIY UPCYCLED DRAWERS! Learn how to upcycle 3 vintage Drawers into a charming silverware holder in this clever, and oh so pretty, project. We hope you enjoyed this selection of Paint Techniques and Projects, as well as the Before and After photos of these pieces. Hopefully these will inspire you to transform your own pieces so that they go perfectly with your décor! That’s the beauty of DIY … you get to make the way that you want it and then you have some original that nobody else has. « Antique Adorable February Fairy Children Image!